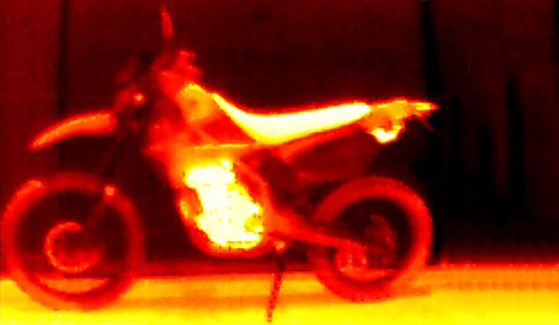 It’s safe to assume that most people have yet to devote a single thought to thermal imaging — and there’s a good reason for that. Up until now, that rarified technology has been the exclusive (and expensive) province of law enforcement, firefighters, contractors, boating pros and the military. But that is starting to change. Earlier this year a product called Flir, which brought artistic-looking thermal imaging to the iPhone, was demoed at Macworld Expo. 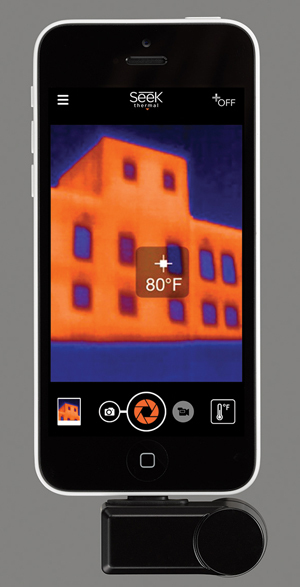 Today, Seek Thermal enters the consumer market with a thermal camera and companion app for both iOS and Android. 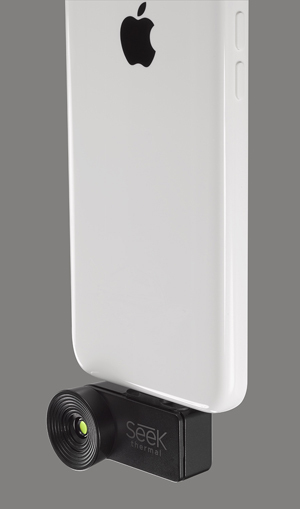 The Seek thermal camera, which weighs about half an ounce and measures 2.75 x 84 x .84 inches, plugs into the device’s Lightning connector. It is based on a proprietary 12-micron sensor chip and custom software. Seek, in conjunction with defense and aerospace company Raytheon, developed a 32,000 thermal pixel imaging chip — with a resolution of 206 x 156 array. 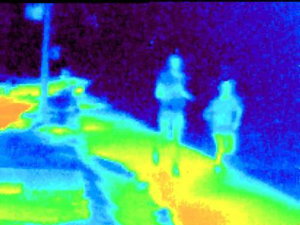 Thermal cameras are useful in a number of situations for safety and security, home improvement, pet protection, cooking, boating and more. For example, if I had a thermal camera on one pitch black moonless night, I might have avoided falling into a campground fire pit and nearly breaking my neck on the iron grill. Homeowners might use it to spot water leaks behind drywall or clogs in pipes. Or you might scan your yard for dangerous predators before letting the dog run around outside at night, or even check for intruders on your property or find your pet in the dark. The list is potentially endless. All objects — animate and inanimate — emit invisible, temperature-based infrared waves. Cameras like the Seek are designed to measure these waves and convert them into images. The camera can’t see through objects, but rather sees the heat transferred from the object onto the surface. 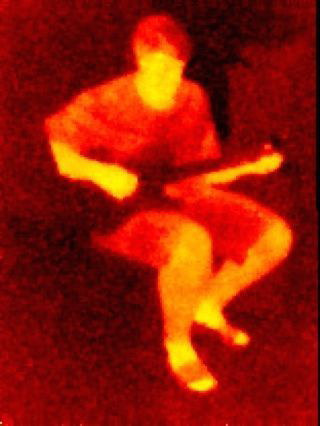 Thermal cameras then calculate surface temperature based on a combination of emitted, reflected and transmitted heat. Thus, different levels of reflection can affect what the visualization looks like. For accurate measurements, cameras like the Seek have small shutters that periodically pass in front of the lens, letting the software recalibrate based on ambient temperature. The temperature differences between the pixels are translated into viewable images that can look intriguing and artistic. The colors, which are arbitrary and can be set by the user in the app, represent a temperature range from cool to hot. Detection ranges from -40F (-40C) to +626F (330C). Seek Thermal’s app features four thermography modes with different kinds of information, and gives you a choice of nine color overlays to apply to the temperature measurements that will create an image. On the photo or video screen, you can turn the Thermal+ control on or off. When on, the app uses both the smartphone camera and the Seek camera simultaneously, letting you switch between them with a swipe left or right. 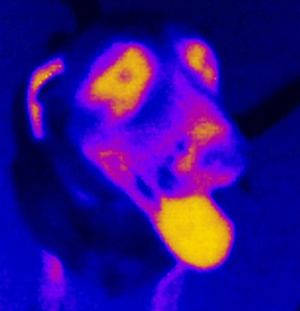 You can take and share thermal photos and videos. The Seek icon at the top of the display takes you to an informational screen that lets you see featured thermal images from other users as well as read about different uses. 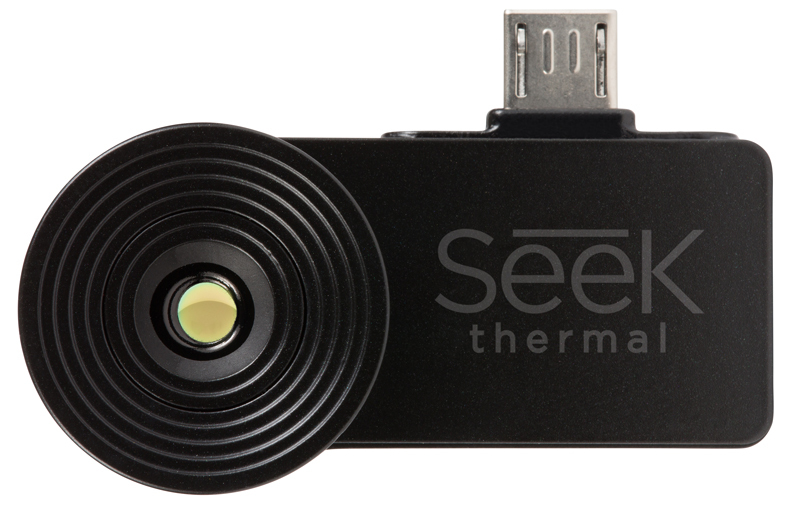 The Seek Thermal camera works with Apple devices that have Lightning connectors, such as the iPhone 5, 5c, 5s, and 6 running iOS7 or iOS 8. It also connects to Android devices with a microUSB connector running Android 4.4.2 (KitKat) or later. Aside from the iPhone, the app has been tested with the Samsung Galaxy S4 and S5 and the Moto G and X. The Seek camera is $199, and can be ordered at Seek Thermal’s website. It will be available at Amazon.com and national retail stores in the US and Canada later this fall. The cameras go on sale tomorrow and will ship when the apps go live in their respective app stores. Seek estimates that will be within one to two weeks for Android, and shortly thereafter for iOS. Next year, the company will release an SDK for third-party developers to create their own apps that leverage Seek Thermal’s technology. Read next: Learn to design for Web and mobile... and name your own price!